In other news I've actually been quite good at remembering to write down one (or six) lovely things for the last 35 days (not including today...it's not done yet)...in between all the normal life stuff cleaning, cooking,everyone having an illness of some sort, the sort of inertia you just have to give into...or become overwhelmed. Day 3 - Books Books and more books. 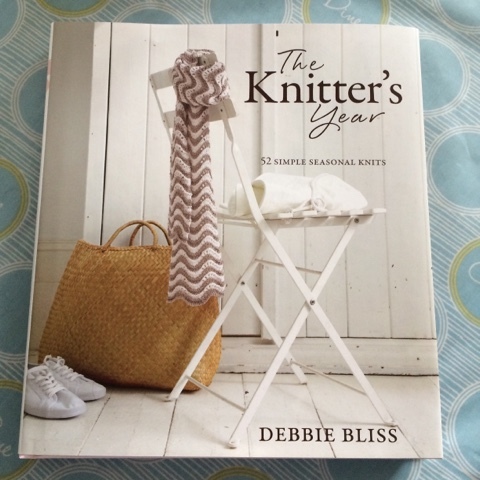 I got lots of second hand craft books from Amazon. Some I'd wanted for ages....they've given me so much inspiration now I just need to get on with it!! I'm going for a face cloth in this one...primarily as I ahve all I need ot get on with it! 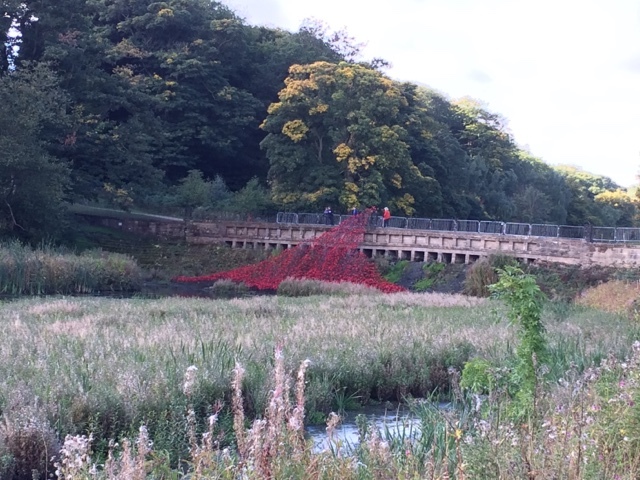 Day 10 Wonderful day out at YSP - seeing Wave and also the Rob Ryan exhibition. I love his papercuts. LittleR loves the semi naked rabbits... "Mummy look the rabbit has no pants on"
Day 13 - Unlucky for some but not us. We had a wonderful child free day together, starting in Leeds (after nursery drop off) with a spot of shopping (a skirt for me - which reminds me of one I had 25 years ago!) and ending with a really lovely lunch here. It was brilliant and just what we needed. 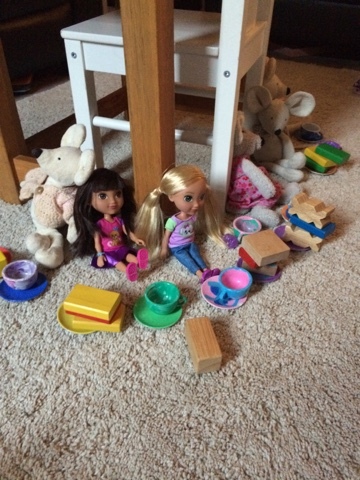 Day 20 - I love it when the girls are able to play nicely together (by that I mean without arguing and without covering the house in pen/paint/glue)...the toys were having biscuits with their tea...Biggest girl obviously leads the play but now Littlest really tries to join in too. Day 23 - I had my hair cut. I had 30cm cut off. I like it when I have a hair cut that you can't not notice. Day 24 - I was going to make a cake but didn't have enough butter (Doh!) and couldn't go out as the girls were in bed...so I hatched a plan for a challah. It was very yum! 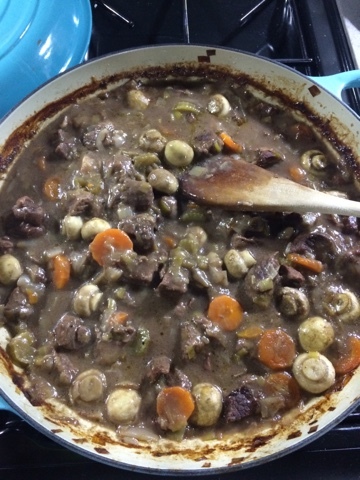 Day 27 - I made the bestest (even if I say so myself) beef stew. I think it was the mushrooms that did it (or the half bottle of very nice wine that went in it as well!!). I love my Le Cruset shallow casserole now I've gotten used to cooking in it. I want some more cast iron cookware! Day 31 - We had a most excellent day out at Fountains Abbey. I've got family membership of the National trust and even though there are loads of places to go in Yorkshire we always end up here. mostly because it opens at 10am (I'm looking at you Beningborough Hall at 11am!!!) and does the most excellent cakes (cheese scones and fat rascals) and lunches! There's an excellent circular walk around the abbey and foundations so you don't have to turn round at any point and decide to come back. It was a beautiful Autumnal day and LittleR was free to run round until she couldn't walk any more. It really is the best exercise to push a toddler up a massive hill in a buggy. Day 32 - sometimes it really is about the little things. Our peg bag went to the great peg bag graveyard in the sky the other week. The ABO had a fit of pique on the muddy grass with our overfilled old peg bag and promptly threw it in the bin and transferred the pegs to a (now very exclusive) carrier bag. I had grand plans to make my own but as I've a HUGE list of things to make and am no where nearer to completing them let alone adding a new on to the list I went to the next best place. Etsy. 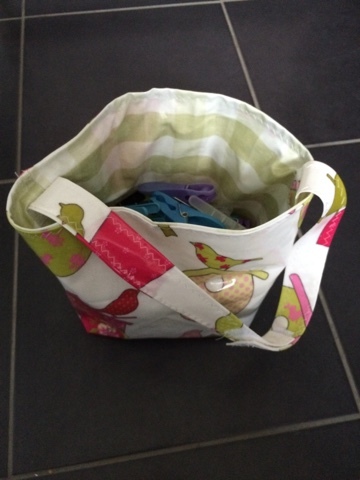 Behold my new and very jolly oil cloth peg bag from KTCreates4u. Day 33 - The ABO is on the early shift this week. Sometimes he's back at lunchtime (after leaving at 4.30am) but it's a busy week and today he wasn't back until after 5pm. The girls and I had a lovely day together, I was able not to be a shouty mummy. It was fab. We fed the ducks (in the rain) at Golden Acre Park, jumped in some muddy puddles and then went out for lunch to Pizza Express for a treat. 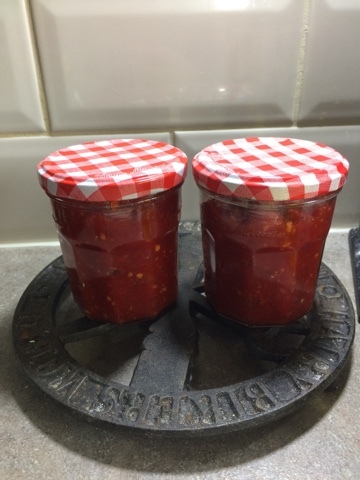 In the afternoon the girls played beautifully (a miracle for me not to act as referee), then watched Frozen with popcorn and I made some (as yet untried) chilli jam. Don't worry it all went down hill the next day, but hey, I was non-shouty for an entire day and it was really noticeable - well to me at least! Here's hoping I blog again in the next 35 days! Its going to be an interesting couple of weeks as we've got half term to look forward to! I'm also looking forward to commenting on your blogs too. I do like this idea of recording something from everyday of a month. All life is there in your lovely post. I love the dollies having tea and biscuits; my kind of crowd! It's so nice to see you, N. I love the toilet conversations, how funny! My daughter used to be so fascinated by my "monthly supplies" and she would ask endless questions and dump them out on the floor to get a better look. I'm glad your girls are starting to play together more, it really is nice to see when they're having fun and getting along. 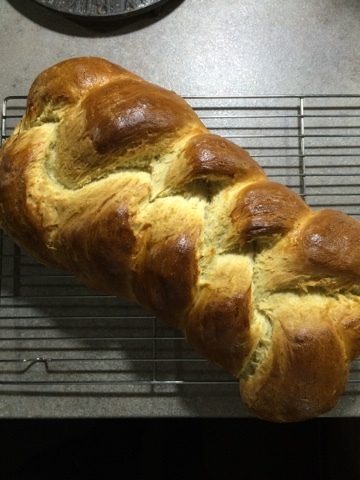 I love the look of your challah. I enjoy baking them too, but I especially enjoy the braiding stage. I hope all is well with your and your family. Take care. Hello! 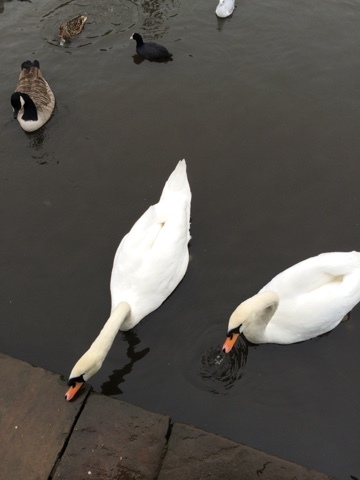 I found you through Leanne and really enjoyed reading your catch up post. Love the new peg bag. I made one when our old one died. It's by no means perfect but I'm fond of it. The start of your post reminded me so much of my son when he was tiny wee and every chap was 'man' too! CT.
Like the look of that book. Like books which acknowledge the seasons. 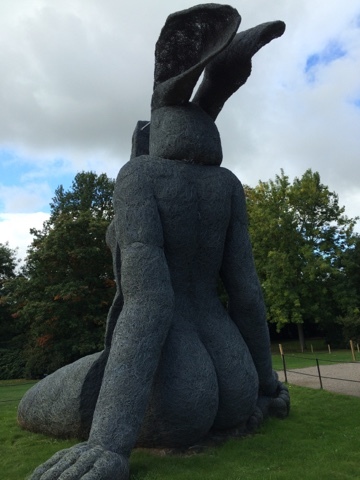 Also, I've always wanted to go to Yorkshire Sculpture Park. Looks good. Those rabbits at YSP are very odd, aren't they? And yes, life seems to be taking over at the moment too. Blogging's taking a back seat and it's frustrating but necessary - and hopefully temporary.